Agonizing Love is a rich anthology of those legendary romance comic books that once filled newsstands to overflowing during their heyday in the 1940s and '50s. "I Craved His Kisses," "With Hate in My Heart," "Kisses Came Second," "Flame of Jealousy," "Was I a Wicked Wife? ": these stories are just a taste of the absolutely riveting dramas that play out in the sob-racked pages of this evocative collection. Agonizing Love—is there any other kind?—runs the narrative gamut from honeymoon to heartbreak, first love to total loss, marital bliss to marriage hell, and all the stops in between. Throughout these colorful pages you will find a diverse selection of cover art and stories enhanced by a plethora of engaging quizzes ("Are You Ready for Marriage? "), confessional letters from readers, informative articles, tips on choosing the right man (or getting rid of the wrong one! ), and oh, so much more! 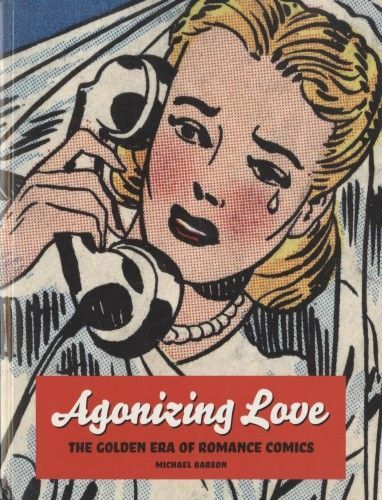 Compiled and with witty, informative com-mentary by pop-culture expert Michael Barson, Agonizing Love is an irresistible treasure trove sure to please comic-book lovers, soap-opera fans, and die-hard romantics who could use a good slap in the face. This is a heartfelt, often tear-drenched valentine to a long lost—but never to be forgotten—era.